How to Solve ‘550 5.1.1 User Unknown’ Error? The filters (in the form of an email) set for the domain. There is no universal solution for the error in all servers like Exchange, Exim, Qmail, etc. Each server needs to be audited and the report should be documented. 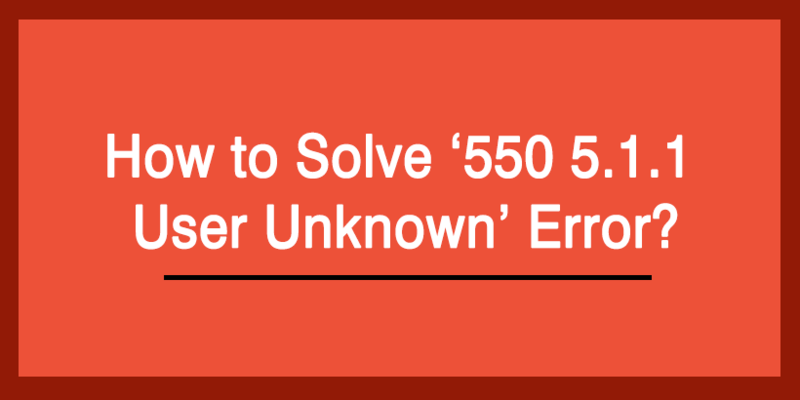 So in this blog, we provide you information which will help you to manage the ‘550 5.1.1 User unknown’ error with better insights. The error ‘550 5.1.1 User unknown’ is a common issue among server administrators who handle Microsoft Exchange Servers. The main reason for the display of the error message is the security parameters followed by the senders. These errors can happen with a distribution group of email addresses and a single account as well. The security parameter which is implemented by Microsoft Exchange 2010 authenticates the sender to prevent spamming and it is enabled on the server by default. While sending, except local email addresses, all other get bounced with 550 errors. It is possible to manage this issue by checking whether any security restriction is associated with the emails which are causing the bounce and email error 550. In order to remove the restriction, do the following steps. Step 1: Open the Exchange management console. Step 5: Go for ‘Message Delivery Restrictions’ then click properties. Step 6: clear the checkbox titled ‘Require that all senders are authenticated’ and click OK. Most of the cPanel and DirectAdmin use Exim mail server in two ways. When some of the servers use it as default installation, others go for the customization. The error message ‘550 5.1.1 User unknown’ is not common in Exim servers. So if you are confronted with such an error, the route cause needs to be identified. The recipient email address has to be checked for tracking the ‘typo errors’ and also you have to ensure that no custom email programs are messing up with mail server settings. The filters and custom rules added to the Exim mail or the specific domain need to undergo through strict verification in order to identify and fix the 550 email errors. Two things need to be verified in order to resolve the error ‘550 5.1.1 User unknown’ in Qmail and Postfix for Plesk servers. Verify whether the recipient domain is properly resolving to the correct server or not and secondly ensure if it has its mail server configured on the server as well. If the MX points to the local servers and found it as disabled, try to enable it. Turn off the mail servers for the domain if the email service for the domain is hosted elsewhere. Make sure that there are no filters or custom rules in the Qmail or Postfix mail server which is messing up with the mail delivery. In order to achieve this conduct a detailed examination of bounced headers and mail logs will make it for you. Identifying and solving the ‘550 5.1.1 User unknown’ error is difficult compared to other server issues. It is even difficult to understand the error based on the error message. There are more variants for ‘550 5.1.1 User unknown’ such as ‘550 MAILBOX NOT FOUND’, ‘550 Unrouteable address’, ‘550 mailbox temporarily disabled’, ‘550 No such user here’, etc. A detailed study in accordance with various servers helps to track the error and to formulate a solution. Since this type of errors is relative to the change in server, instead of a direct solution, this blog will direct you precisely in your study and to track the error.